Land prices are falling across Australia. Yet the politico-housing complex strains at every sinew to hide this from first home buyers and jolly them into making a life-long commitment at the very worst time in eighty years. Problem is, the buyers know. They are very, very aware land prices are ridiculous and we are in for a crash. Low interest rates, cruel government incentives and builder discounts don’t matter one bit when prices are falling. Committing for thirty years to an outer urban slum-in-the-making with no transport, no community facilities and surrounded by cow paddocks is not the only option available to first home buyers. First home buyers can rent and save. The gap between the cost of renting and the mortgage repayments needed to buy an equivalent property is enormous. They can migrate and buy in countries where prices have already corrected. They can build personal wealth in the share market. Eventually, they will be able to buy a home at a fraction of today’s cost and save again. They know. Previously they were unsure and tentative. Now they KNOW and the statistics prove it. And that’s the rub – the excluded are not going to buy until prices reset. Those that jump in now are being laughed at behind their backs. Eyes are rolling. 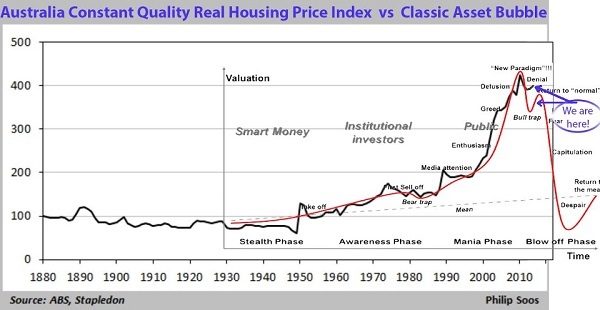 The graph of house prices by Philip Soos from Stapledon and ABS data – adjusted for the effects of inflation and quality – shows Australian prices were aiming for the stars. Not everyone has been trained to read charts, so let me explain what this means with a metaphor. Imagine a flying airplane on full power. It turns up. Up harder. Up harder, until its flight is almost vertical. Eventually it will run out of air for the propellers to thrust. It must then fall like a brick – tail first. A skilled pilot can turn the plane to one side into a dive and re-engage with the air. But he will lose a lot of altitude (price). 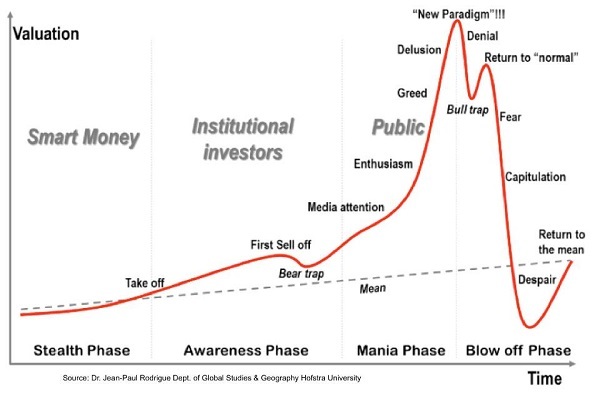 Bubble markets are the same. Price change becomes exponential, but eventually speculators cannot afford more debt or banks discover caution or the sheer folly of the times becomes obvious. The Economist has a useful typical profile of what bubbles look like (below). Prices don’t simply go up then down. The phases of market emotion are easily identified. Does Australia’s price path match this universal bubble graph? Oh, yes! Beautifully. The land market is the slowest moving of all tradable goods. Only around four per cent is sold in any year. The abrupt ‘Blow Off’ above is imminent and will take around four to five years to complete. There are a lot of losers in a land price correction all the way up the food chain: builders, developers, estate agents, banks, government, second home buyers and investors. Falling land prices drive the heavily indebted into negative equity. Sales volumes collapse – no one wants to catch a falling knife. Everyone saves like mad. Demand plummets. A debt-deflation recession (the very worst kind) begins. So very many people face personal financial destruction because of their speculative debts it is impossible to say the unmentionable out loud – it would seem like shouting ‘Fire!’ in a crowded cinema. Even though the price reset will destroy the finances of many. Even though an early retreat would minimise the harm. Australia’s big secret is, everyone KNOWS. Reminds me of an analogy of the Air France flight 447 that crashed in 2009, as seen on 60 minutes on Sunday night 12th May 2013. A tragedy in that the lest experienced pilot had misread the controls and had also ignored the plans auto warning message of stalled, stalled over 50 times, while still sending the nose of the plan skywards the plan subsequently was falling out of the sky backwards. When they realized they were 1 1/2 minutes from dying there was just silence – saying i cannot believe this is happening. Could also be used to discribe Wayne Swans current economic out look. Its the crash we really had to have and it should have happened 2 or 3 years ago but crazy investor speculation and first home buyers grants have artificially delayed the inevitable. And made what’s coming even worse than what it should have been. Our crash could actually be bigger than the USA and with unemployment rising steadily now (Example – Ford Australia) this adds fuel to the fire. People without jobs cannot pay mortgages or qualify for home loans. Brace your selves, this could be catastrophic. I think this prediction is spot on…only he was just a bit premature. It’s interesting that the bubble peaked in SE Queensland in 2007, earlier than in Melbourne in 2010. A negative gearer who set-up in SE Queensland in 2007 has now been losing wealth for 7 years and will continue to be at a net loss for at least a few more years. That will add up to at least a decade making absolutely no increase in wealth from their strategy whatsoever. Hopefully such people can afford to lose their money.